I found 41 Hotels in . 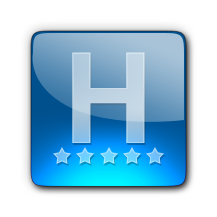 Select the check-in and check-out dates to see the available hotels in . Without informing dates, prices with (*) are average prices for each hotel and around to a distance of 15 km. The 5-star Park-Hotel Sonnenhof in Vaduz features an award-wining gourmet restaurant and a private park with panoramic views of the Alps, the Rhine Valley, Vaduz Castle, and the nearby vineyards. Free WiFi is available. The restaurant marée was awarded 1 star by the Michelin guide and 17 points (3 toques) by the Gault Millau guide. Spa facilities at the Sonnenhof include an indoor pool and a sauna. Free parking is available on site. Located in Vaduz, this apartment features a balcony. The property a 15-minute walk from Vaduz centre and private parking is offered. Free WiFi is provided throughout the property. The kitchen features a dishwasher and an oven and there is a private bathroom with bath robes and slippers. Towels and bed linen are available at Residence Apartment. Free use of bicycles is available at the property and the area is popular for skiing and cycling. Davos is 45 km from Residence Apartment, while Arosa is 41 km from the property. Set in the pedestrian zone in the heart of Vaduz, the modern 4-star Residence Hotel enjoys a location right below the Vaduz Castle. Guests can enjoy their stay in the stylish and well-equipped rooms and suites. WiFi is offered in the entire hotel for free. A flat-screen HD TV with satellite and pay-per-view channels, as well as a minibar, a kettle and a safety deposit box, are provided in all en-suite units. The suites come with a balcony overlooking the Alps and the castle. International and regional cuisine can be sampled in the on-site à la carte restaurant. Residence Hotel additionally houses 2 bars, and a private business centre is at guests’ convenience. To relax after a busy schedule, massage treatments are available at an additional cost. Upon request and against a surcharge, Residence Hotel offers airport shuttle, bike rental and car hire arrangements. Hotel Real is situated in the centre of Vaduz. It is a dependence of the neighbouring Comfort & Business Hotel Residence and offers a free internet terminal with a printer in the lobby which also features a terrace. The hotel offers comfortable rooms, all equipped with a variety of amenities. Free access to Wi-Fi is available in all rooms. Located in the city centre, you will find a number of cultural activities to enjoy, such as a number of museums and a castle. Dating from 1380, this historic 4-star hotel is set amidst vineyards in Liechtenstein’s capital city of Vaduz. The centre is just a 3-minute walk away. Free Wi-Fi is available. Each room at Gasthof Löwen is individually designed and features a minibar, wooden floors, and a bathroom. The restaurant serves Liechtenstein specialities and international cuisine, as well as a large selection of fine wines. Some wines come from Hotel Löwen’s own vineyards. In summer, guests can dine on the terrace. Free private parking is available at Hotel Gasthof Löwen. The Swiss A13 motorway can be reached in a 15-minute drive. Buchs Train Station is 10 minutes away. The Landhaus am Giessen is located an easy walk or a short bus ride from the centre of Vaduz in Liechtenstein. It offers free parking and free Wi-Fi. Each room in the Landhaus am Giessen has an en-suite bathroom and a balcony. Every morning you can choose from the breakfast buffet. A small terrace invites you to relax during the warmer months. Located in Vaduz, Landgasthof Mühle offers a restaurant and free WiFi access in all areas. Free private parking is possible on site. The rooms at the Mühle Landgasthof all come with a TV, a minibar, a desk and a private bathroom with bath tub and hairdryer. The house features a garden, a sun terrace and luggage storage. Set in Vaduz, Apartment Auring offers self-catering accommodation with free WiFi. Apartment Auring boasts views of the mountain and is 48 km from Lech am Arlberg. Free private parking is available on site. The unit equipped with a kitchen with a dishwasher and oven. A flat-screen TV is provided. There is a private bathroom with a bath. You can play tennis at the property, and the area is popular for skiing and hiking. Davos is 44 km from Apartment Auring, while Arosa is 41 km away. Located in Schaan’s town centre, Hotel Schaanerhof offers a restaurant and a terrace with a view over the Rhine Valley. All rooms at the Schaanerhof are equipped with free Wi-Fi, a minibar, cable TV and telephone. Every room has a spacious bathroom with a hairdryer, and some also have a private balcony. The rich buffet breakfast includes fresh fruit and freshly baked bread. Guests can also visit the spacious lounge room, where they can warm up by the fireplace and play a game of billiards. The hotel is 7 minute’s drive from Vaduz and 25 minute’s drive from the Malbun ski resort. Schaan-Vaduz Train Station is a 10-minute walk away. 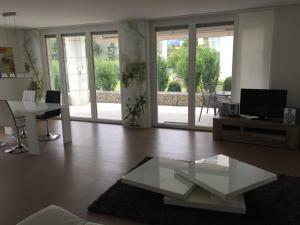 This spacious, elegantly furnished apartment is a 5-minute drive from the centre of Vaduz. It offers free WiFi and a balcony overlooking the mountains. Penthouse Apartment in Vaduz features a bedroom, a living room with a fireplace and a sofa bed, a kitchen, a bathroom, and a balcony overlooking the mountains. Free private parking is available on site. The Malbun Ski Area is 5 km away.